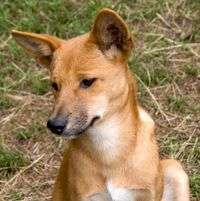 (PhysOrg.com) -- Australia's native dog  the dingo  may have arrived here much earlier and by quite a different route than previously thought, a new study has found. The study found genetic evidence that dingoes and New Guinea's native singing dogs originated in South China and travelled through Southeast Asia and Indonesia to reach their destinations - not, as previously believed, through Taiwan and The Philippines, which would have required multiple sea crossings. "Clearly, the land route is much more feasible for dogs than the sea route," says UNSW geneticist Dr Alan Wilton, one of an international team of researchers who report their findings in the journal Proceedings of the Royal Society B. Although the earliest archeological record of dingoes is about 3,500 years old, new genetic studies suggest it last shared a common ancestor with the domestic dog at least 5,000 years ago, says Dr Wilton, a senior lecturer in the UNSW School of Biotechnology and Biomolecular Sciences. The study made genetic comparisons of more than 900 dogs and dingoes, plus three New Guinea singing dogs. The samples came from far and wide across place and time  from South China, mainland Southeast Asia, Indonesia, New Guinea, the Philippines and Taiwan, as well as genes previously identified among ancient, pre-European samples from Polynesia and the Australian dingo. It confirmed South China as the most likely origin of domestic dogs, probably about 10,000 to 16,000 years ago. Genetic variants found only in dingoes and New Guinea singing dogs suggest their dispersal occurred earlier than the dogs that accompanied the first people to colonise Polynesia, from about 3000 years ago. The study notes that the dog is unique in that it was the only domestic animal accompanying humans to every continent in ancient times and was the only domestic animal introduced into ancient Australia. "The dispersal of dogs is also linked to the human history of the region, and may contribute knowledge about, for example, the geographical origins of the Polynesian population and its Neolithic culture, and the extent of contact between the pre-Neolithic cultures of Australia with the surrounding world," it says. Dingoes and New Guinea singing dogs share a genetic marker in common with other dogs but lack a mutation found elsewhere, notably in East Asia, suggesting that the dingo population was founded from a small number of dogs. Dr Wilton was also involved in an earlier study in the journal Nature, suggesting that the dingo and the New Guinea singing dog may be the world's oldest dog breeds and are most closely related to wolves.